Falls from height in the workplace are responsible for many serious and fatal injuries each year. Even a fall from a height as low as two metres above the ground carries the risk of a person sustaining serious injury. In addition, the person may not fall on open ground and the risk of injury may be greater if the fall is onto objects below the workspace. Simon Courtney provides an overview of fall arrest PPE. The risk of a person falling is typically controlled using a hierarchy of protection. This begins with finding alternative ways of working from ground level, such as removing the ‘height’ itself, and ends with the use of personal protective equipment (PPE). Fall arrest PPE is widely used where work is carried out at height and is designed to protect against falls. The basic principle of such equipment is to prevent serious injury to the user by catching them at an earlier stage, namely before the energy associated with the fall reaches terminal levels, either when hitting the floor or due to decelerations that are likely to cause death. A wide range of working at height equipment is available including fall arrest harnesses, lanyards, karabiners and connectors, anchor devices and work positioning systems. In Europe all protection against falls from a height (except equipment only intended for rescue and some components permanently attached to a structure) must be CE marked and is considered complex category III protection, according to the PPE directive89/686/EEC. CE marking is achieved by testing to an appropriate specification (in most cases, a European harmonised standard) in conjunction with assessment of documentation and the system to ensure ongoing conformity of the product. CE marking must be carried out by a European Notified Body. The testing of fall protection equipment is typically carried out on the whole product as presented for sale, although testing and approval of components (such as connectors) can be carried out where they are interchangeable between complete systems. In addition, consideration must be paid to the whole system of fall protection, including components worn, components carried and / or operated, and the method of fixation to the structure. In most cases, a system of fall protection will be made up of several components, each one CE marked in its own right, meaning that the end user will need to consider the compatibility of products. Although the distance the user can be allowed to fall will vary depending on the environment in which the product is being used (nominally the distance to the ground), the force that can be applied to the user is limited throughout Europe to 6kN. This limit is evident in most fall protection standards, either in terms of requirements, or the basis for the tests themselves. The use of PPE when working at height is intended to reduce the main hazard of falling but may introduce ‘minor’ hazards. These include swing hazards, collision in mid-arrest and injuries caused by the equipment itself (such as bruising from constriction by harness webbing). The potential for permanent injury and possibly fatal consequences will increase the longer the user is left suspended following a fall. As well as the need for treating any injuries sustained in a fall, there is the effect of suspension trauma (constriction of blood vessels and pooling of blood in the limbs) to consider, which can have fatal consequences if the pressure on the user is not released within good time. The need for suitable training is, therefore, important before use as is having a system in place to ensure that a rescue can be enacted in the shortest time possible. The worst-case scenario should be considered: where the user who has fallen has lost consciousness. Harnesses are used in conjunction with a fall arrest system or anchorage device and are intended to hold the user in place and spread the load in the case of a fall arrest scenario, e.g. being brought to a stop following a period of free-fall. They are designed in a number of different types including full body harnesses, work positioning and sit / abseil harnesses. Lanyards are used to connect the attachment point of a harness to a suitable anchorage device. Some types of lanyard are intended for use as a component of a larger system, which should include a shock absorbing element. Other lanyards, on the other hand, include a shock absorbing element intended to reduce the force applied to the user by gradually arresting the fall. Retractable type fall arresters may contain a lanyard of practically any length, and will retract (under a spring loaded mechanism) back onto a drum in the casing of the device. In the case of a fall, a braking device (or similar) will cause the drum to lock, arresting the fall of the user in as short a distance as possible. Harnesses are subject to dynamic performance testing intended to apply a shock load on the product exceeding that likely to be experienced in use. The test will give an indication of the behaviour of the harness when used, in particular the angle at which the user will be held in the event of a fall. 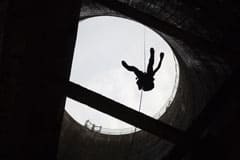 Users should remain vertical in the event of a fall and should not come to rest upside down, as this may add to disorientation and may make self-rescue more difficult. They are also subjected to static performance testing where tensile forces are usually applied and held for at least three minutes, to ensure the breaking strength of the product is in excess of the force specified by the standard. Shock absorbing lanyards are subject to a drop test intended to assess the performance of the lanyard in terms of its ability to arrest a fall within a maximum distance, while limiting the force on the wearer to a suitable maximum. In particular, the lanyard should not deploy (stretch, open, tear) beyond a maximum length stated by the standard, with a maximum force of 6 kN, during a fall using a test mass dropped over a distance of twice the length of the lanyard. Retractable lanyards are subject to a drop test similar to that used for lanyards. A clip is applied to the lanyard to prevent it being retracted back into the case, and allow a clear freefall. The lanyard should not deploy beyond a maximum length of 1.4 metres (essentially arresting the fall within 2 metres from the point of release), with a maximum arrest force of 6 kN. A work positioning system is a system of components attached to a vertical life safety rope and includes a full body harness, descent controllers and positioning lanyards used to support or suspend a worker at a work position. Metallic components used in fall protection equipment are subjected to a neutral salt-spray test intended to prove a minimum resistance to environmental corrosion, specifically rust. Products are held within a sealed chamber, which is filled with a salt-water mist, which can induce rust in unprotected metals. Products are subjected to either 24 or 48 hours exposure and examined for rusting and function afterwards. In the case of mechanical devices, additional testing is required to ensure they are not adversely affected by environmental conditions. Devices are checked for their locking function (by dropping a mass of at least 5 kg) following conditioning to high temperature (50°C, 85 % relative humidity for at least two hours), low temperature (-30°C for at least two hours) and water (sprayed at 70 litres per hour for at least three hours). Optional testing following submersion in diesel oil or dust can also be included for applications where the products might be expected to be exposed to severe conditions. Anchor devices are intended to form the interface between the fall arrest system (harnesses, lanyards, retractable lanyards etc.) and the structure. These can be in the form of single bolts, slings, deadweight devices or anchor systems (rails or cables). Anchor devices are subject to a series of drop tests carried out on the device fixed as intended, and in every intended direction of use. This often means a series of tests with the device fitted to a number of different substrates. This can mean testing on a very large scale as devices need to be installed as they would be used (often fitted to sample roof surfaces or structures). The tests required are dependent on the class of the device. Whole anchor products are subjected to tensile tests. These forces are usually between 12 kN and 18 kN depending on the type of anchor device. Tensile forces are applied and held for at least three minutes to ensure the breaking strength of the product is in excess of the force specified by the standard. Metallic components are also subjected to a neutral salt-spray test intended to prove a minimum resistance to environmental corrosion as previously described. A second European standard (EN 517:2006 – ‘Prefabricated accessories for roofing. Roof safety hooks’) exists for roof hooks that are intended for the attachment of roofing ladders or supporting work platforms, but that may also have a facility as anchorages for PPE against falls. EN 517:2006 classifies roof hooks as either Type A or Type B, depending on the direction in which any force may be applied. BS EN 353-1:2014 Personal fall protection equipment. Guided type fall arresters including an anchor line. Guided type fall arresters including a rigid anchor line. BS EN 353-2:2002 Personal protective equipment against falls from a height. Guided type fall arresters including a flexible anchor line. Guided type fall arresters are subject to a drop test using a 100 kg mass dropped over the maximum distance the device will allow – essentially by raising the mass until the travelling device begins to slide up the cable or rail. The device should arrest the fall within one metre from the point of release, with a maximum arrest force of 6 kN. Due to some issues in EN 353-1 the presumption of conformity has been removed for this standard. Therefore, additional drop testing is required on these systems to ensure that they operate as required during a fall. At SATRA this additional testing involves using a 100 kg articulated dummy released from at least four different postures. In these tests, the dummy must be arrested in a safe manner within a distance of two metres. Whole products are subjected to tensile tests. Textile lanyards are subject to a 15 kN tensile force and metal to 12 kN. Tensile forces are applied and held for at least three minutes to ensure the breaking strength of the product is in excess of the force specified by the standard. In the case of mechanical devices, additional testing is required to ensure they are not adversely affected by environmental conditions. Devices are checked for their locking function (by dropping a mass of at least 5 kg) following conditioning to high temperature (50°C, 85 % relative humidity for at least two hours), low temperature (-30°C for at least two hours) and water (sprayed at 70 litres per hour for at least three hours). Optional testing following submersion in diesel oil or dust can also be included. Metal devices are also subjected to corrosion resistance tests. Connectors or karabiners are key components used to connect parts of the fall protection system in a flexible but safe and secure way and are covered by BS EN 362:2004 PPE against falls from a height. Connectors are subject to a range of tensile strength tests, applied in several directions, depending on the type of connector. Where a connector has only one possible direction of loading (e.g. where one end of the connector is permanently attached to another component), loading is applied in only one direction. However, where foreseeable misuse could result in loading being applied in directions other than the ‘main’ direction, testing is required in both the major (length) axis and minor (width) axis. In addition, where connectors do not automatically lock on closure, testing is carried out with gate both locked and unlocked. Non-automatically locking connectors require the manual operation of a screw sleeve which closes the gate. Automatically locking connectors may incorporate a spring-loaded mechanism that locks the device once snapped closed. Connectors are also subjected to corrosion resistance tests. The correct use of certified fall protection products along with adequate training and suitable rescue procedures will greatly reduce the risk of injury to persons working at height.